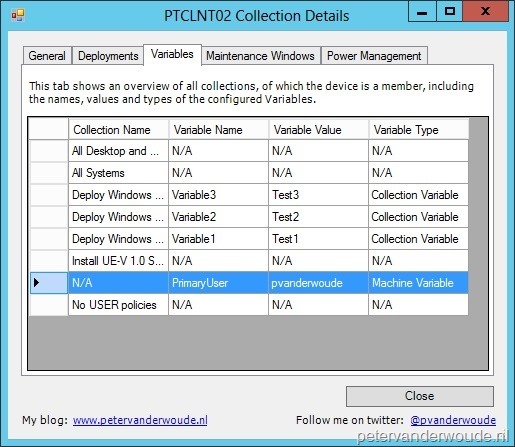 This week my post will be all about the end result of my series, about showing the Collection Details, of a device, via a PowerShell form. I changed a few small details and added another new tab, with more new information! 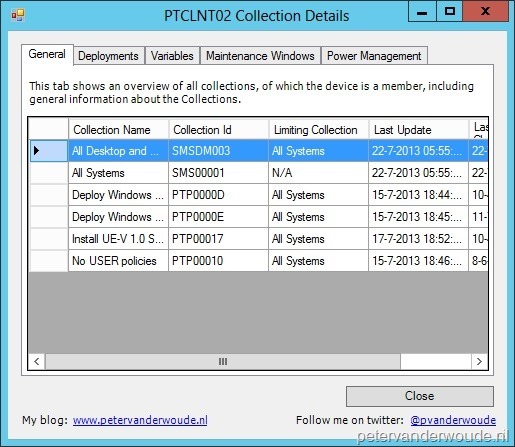 This new tab shows all the General information about the collections, of which the device is a member. As there is (almost) no more information that can be added, about collection information that affects the device, this will be the last addition to the script/ form. In case someone still misses some important, or logical information, please let me know! (New!) The Name of the Collections. (New!) The Id of the Collections. (New!) The Limiting Collection of the Collections. (New!) The Last Update of the Collections. (New!) The Last Membership Change of the Collections. The Name of the Collections. The Name of the targeted Deployments. The State of the targeted Deployments. The Type of the targeted Deployments. (Updated!) The Type of the Variable. The Start Time of the Maintenance Window. The Duration of the Maintenance Window. The Recurrence of the Maintenance Window. The Type of the Maintenance Window (including the, in R2, new type, for Software Updates). Whether the Maintenance Window is enabled or not. The Name of the applied Non-Peak Power Plan. The Name of the applied Peak Power Plan. The Start Time of the applied Peak Power Plan. The End Time of the applied Peak Power Plan. The Wake-up Time of the devices in the Collection. Note: When there is there is no Limiting Collection, no targeted Deployment, no Deployment State, no Collection Variable, no Maintenance Window, or no Power Plan then the empty field(s) will show N/A (as in Not Applicable).